Disclosure: We received sample products to help facilitate the post. All opinions stated are genuine and my own. A lot of you are going through the crazy weather changes right now. I know because we're going through it. Last weekend we went out in shorts, this morning for the school run we were bundled up in winter coats, hats and gloves (and we were still cold). When the weather fluctuates that wildly, colds and flu never seem far behind. That's where Cold-EEZE comes into play. When it comes to dealing with a cold, tempers and temperatures can reach a fever pitch (pun intended) fast! Your throat feels scratchy, your nose won't stop running and all you want to do is sleep! To help bring your symptoms down to a manageable level, the staff at Cold-EEZE Cold Remedy put together some great do-it-yourself tips for home cold remedies. Be sure to try the new Cold-EEZE Cold Remedy Plus Natural Multi-Symptom Relief Cold & Flu QuickMelts, formulated with zinc gluconate to shorten the duration of the cold by nearly half! 1. Stuffy nose? Use steam for relief. You don’t need a fancy humidifier to ease congestion (though it can be convenient!). Slowly breathing in steam from a pot of boiling water can work wonders! Just make sure to be very careful — you don’t want to burn your nose! 2. Make it spicy. Incorporate lots of cinnamon, nutmeg, rosemary, cloves, pepper and ginger into your sick-day diet. Spices are natural ways to help boost your immune system and fight off viruses and diseases. Some other ingredients to include? Garlic, honey and coconut oil. Check out some more natural cold medicine. 3. Try chicken noodle soup. A nice hot bowl of chicken noodle soup might be just what you need to fight off that virus. It’s a delicious home remedy that’s medically backed to help ease cold symptoms. Check out some of our Cold-EEZE Cold Remedy-approved tasty recipes by visiting us on Pinterest, and make sure to include plenty of veggies! 4. Make your own nasal spray. It’s easy and takes a matter of minutes! Simply mix 3 teaspoons of iodide-free salt and 1 teaspoon of baking soda and then add 1 teaspoon of the mixture to 8 ounces of warm boiled water to create your own nasal spray solution. Use a bulb syringe to gently squirt the mixture into each of your nostrils, while holding the other one closed, and letting them drain. This will help clear nasal congestion as well as remove virus particles and bacteria! 5. And of course, drink plenty of fluids. It’s so important to stay hydrated, especially when you’re sick. By drinking plenty of fluids regularly, you can help break up congestion and ease a sore throat. Some great options include water, herbal teas, natural juices (no sugar!) and ginger ale. Also be sure to check out some of our favorite healthy hydration recipes. One lucky winner gets to take home a great assortment of Cold-Eeze products (not exactly as pictured). US entrants only. I never thought to make my own nasal spray. I always get terrible sinus infections and this would help me a lot I think. Great tips here Rosey. I didn't know about the nasal spray. You could use that in your netti pot! Also, I like extra vitamin C. I felt a sore throat coming on and took an extra vitamin C at night - no sore throat this am!! Love your tips. Is Cold EEZE available to Canadians? Thank you thank you for sharing this!!!!! I haven't had any colds problems since I stated eating garlic every day & thats been about 2 years. Before that I'd get colds especially winter time. I guess I love garlic because I'm Italian. Ha,ha,ha. Have a wonderful Friday Rosey. See ya. Chicken Noodle Soup is my go-to also. Even if it doesn't cure it, it make my tummy feel better! I've tried steam for sinus congestion before and it really works. I can sure use these tips because I have a cold right now. When my sinuses aren't working right, I go right for the spicy food. Clears them up almost immediately. 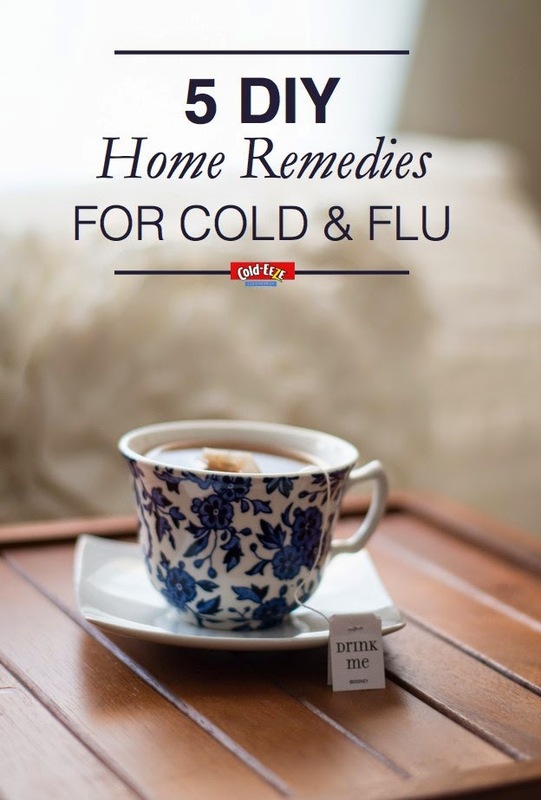 Thanks for sharing the home remedy information for cold and flue! Great post! I'm a HUGE fluid drinker when I'm sick - always makes me feel better! I like the huge variety they have! K has bronchitis right now and I feel like I'm getting a sinus infection! UGH! Shouldn't this season be over? Great tips. Doesn't a cold make you feel miserable. Really, really miserable. I love the idea of making your own nasal spray! Also, I love Cold-Eeze and I'm going to check out their recipes! Cold-Eeze really does work. Right now I am fighting allergies I think-or I have a heck of a cold!! I think I better run out and get some-at least my head won't hurt as much!! I love all of those when I have a cold/ flu! I once used TOO much ginger! I love chicken soup and chamomile tea. It's great that there are some natural ways to get rid of those pesky colds. I'm hoping I don't get sick again before the warm weather comes. I learned that Cold Eeze can help quicken the duration of a cold up to 50% . It's a homeopathic cold remedy made with a unique zinc gluconate formula. Wish I had this right now. Been fighting a cold for over a week now. Cold-EEZE lozenges help shorten the length of time you have a cold by half. These must be some super strong lozenges! It's always good to have a few go to Cold DIY remedies at arms reach. Since most of the time with have natural organic honey and lime, that is normally our first route, steams and soups are also very high on our list, and then we go from there. I like it all..I have a cold and the lozenges do help! Great tips! I do a lot of honey and coconut oil when I am sick, and it really does help! I like that they have a multi symptom relief. Sometimes you just don't know what's wrong. I learned:Cold-EEZE® lozenges are proven to shorten the duration of the common cold by the Cleveland Clinic (1996) and Dartmouth College (1992) studies. I'd like to try the Cold Eeze lozenges! I like that they offer immune support and immune support + energy varieties. I always use the old time remedies when I get a cold. I haven't had a cold in a while though. great tips, rosey!! i love eating spicy foods when sick...it's amazing how it really does help! I love these tips. With all this cold weather lingering around have options like these are great! I like the Cold-EEZE Daytime/Nighttime QuickMelts. liked how many different products they had. I learned that their lozanges have actually been proven to shorten the duration of the common cold. I believe I am in the start of my first bed cold, the darn pesky little sore thoat thing. I am going to try some of their ideas for my cold. I learned that the zinc ions keep the cold virus from multipying. No wonder it helps get rid of a cold faster! I learned that the recommended daily dosage is 6 lozenges. I had no idea it as so many! I would like to try the Cold-EEZE® Cold Remedy Oral Spray Plus Sore Throat. I have not tried it yet. Our unique zinc gluconate formula releases zinc ions to fight your cold virus. I love the Cold-EEZE Cold Remedy Lozenges. I learned that they are clinically proven! That is awesome! I really dislike being sick, and would love to have something on hand when I start to feel ill, that can help. Their unique zinc gluconate formula releases zinc ions to fight your cold virus. I learned that Cold-EEZE® lozenges have been clinically proven to shorten the duration of the common cold by almost half. I learned that their unique zinc gluconate formula releases zinc ions to fight the cold virus. I do a lot of those remedies myself. I made a concoction tonight.... Not for a cold, but it would sure work for it. Cold-Eeze is such a life saver in my house. I probably would not survive the winter without it. These are really great tips! We use these products as well and they work great! Thanks for the giveaway! Great ideas. Knock on wood but we have all stayed healthy this winter and spring so far. I found it cool that the formula releases zinc ions to fight your cold. I've heard really good things about the Coldeeze products. I'm glad you found something that really works. We always do 1,2 3, and 5 but 4. I did not know that you can make your own nasal spray, thanks for sharing. I do all of these. The steam method has saved me numerous times. My go to for many years has been essential oils. I wont use OTC meds unless it is absolutely necessary because they tend to just make me feel worse. I have never heard of coldeeze before! These are some great tips! Chicken noodle soup and plenty of fluids always help when I'm feeling ick! Especially with the post-Easter sugar rush causing so many viruses in our area. My mom has always sworn by chicken sou. My grandmother made it the best and it really did help us feel better when we were kids. I caught an early spring cold and with my allergies combined it has not be fun. Those are some great tips. When I start to feel sick I always make a huge batch of chicken soup. I always find that it helps. This is so helpful to stay cold and flu free this season! ;) Thanks for the giveaway too. It felt like we were sick all winter. I will definitely pin this just in case we get sick again next winter. Now that spring is here I really hope it means no more colds. I am so happy to finally open the windows and get some fresh air in the house. Now that spring is here, this is way too perfect. I've never tried DIY-ing nasal spray though. Didn't even know it is possible. :) Thank you. Soup, nyquil, and hot green tea with honey gets me through the sick days. I never thought to look up diy remedies such as nasal spray. Very good idea. Thank you so much for the tips! This is a great time for them since people are going through transitional colds right now. So many good tips. We were pretty lucky this year and skipped the cold and flu season so far. Let's hope it stays that way! A hot bowl of chicken soup always clears my nose and heals colds.